Welcome to Day 3 of our Winter 2014 Reveal Week! Layle here as your tour guide today to walk you through four brand new Simple Sets - Fresh Air, Summer Paradise, Hey Mom and Hey Pop! 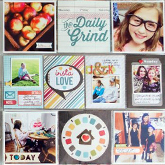 Simple Sets are mini, themed collections consisting of 6 12x12 double sided patterned papers, two 6x12 sticker sheets and a Collection Pack; they're a pint sized package of Simple Stories goodness :) They're just perfect for your themed layouts, Life Documented/Pocket Page scrapbooking spreads and paper crafting projects! Simple Sets begin shipping to retailers mid February, just in time for your spring scrapbooking and paper crafting projects. How about a chance to win a Simple Sets prize pack before you can buy it?!! You have 2 chances to win! Second - PIN TO WIN! Just pin your favorite of the Simple Sets images in this post, tag your pin with simplestories and simple sets, then leave us a comment on this blog post telling us that we've been pinned and include your Pinterest user name. Good luck - we can't wait to hear what you think about our new Simple Sets! And remember, today is only Day 3 of SIX, there's still 3 more days of fabulous new Simple Stories products, so meet me back here tomorrow morning for Day 4! The new SN@P! products begin shipping to retailers mid March. I know I'm counting down the days, how about you? So friends, what are YOU most excited about today? I LOVE the spring set!!! It is so fresh and clean looking....she said as she sits in the house looing outside at -8 degrees! Wow wow wowwwwwwwww!! I am in LOVE with all of these! WOW WOW WOW! Can't wait to create with these!! WOW!!! My favorite is the Hey Pop!, but I love all of these! LOVE the colors in each set!! oh i love summer paradise perfect for this hot weather here in australia. have pinned you. Love the colors in the Hey Mom set! Absolutely love the simple packs!! They are amazing!! I think Fresh Air would be my favourite, although they are all great for different reasons! Loving all the new collections coming out and and can't wait to see the rest! hard to pick a favorite! love the summer set and Hey Mom colors. Yall are killing me with these collections... they are so stinkin' cute!!! I think my favorite is the Summer Paradise, but Fresh Air is really cute too!! I Love the looks of the Summer Paradise line -- bright and clear without going over the edge into neon!! Adore them all...but Hey Pop is my favorite! I'm in love with all of the new collections! But, Summer Paradise is my favorite - love all that color! I LOVE all of these! Are you ever going to release your stuff in digi format?? Please say that is tomorrow's sneak peak!! In love with the Hey Pop collection. The coupon paper is just too cute! Love all the new collections but Hey Pop really stands out. What a fun collection! Can't decide whether my fave will be hey mom or hey pop.. I adore them both! Goodness Gracious....I need a Lottery Win - I want it all!! These are so flippin cute!! can't wait for summer paradise to hit the shelves! Very cool! Summer Paradise and Hey Pop are sure to be favorites! I always think that you can't top what you already have...but you keep doing it! Wow...just wow! OMG!! I LOVE them all!! How am I going to afford of these cut paper collections??? I like all collection - so many awesome stickers! Fresh air and Summer Paradise are my favorites, I like colors and designs. Love all the new collections! They are all so adorable!!! These are great. I really like the Fresh Air one. I pinned the Fresh Air simple set.... http://www.pinterest.com/pin/279012139388331557/ But will be pinning them all...I love them all!! My Pinterest name is jlzeimetz. These are just lovely! All of them. Mini collections are so lovely! I adore those minis for not being boring as you are done with them in like 4 pages. May I win some? Please? I love Summer and Hey Mom! I think the spring set is my favorite but summer is a close second. They are all super cute! I can hardly wait for February! I especially like Hey Pop! since I'm always looking out for unique masculine papers to scrap my husband and son! Love all the sets but Hey Mom is my absolute favorite! Once again you make it really hard to pick one! Love all the sets, but the spring set and Hey Mom are running a close first! Thanks for great products! I love these mini sets! My favorite is the Fresh Air Spring set. Thanks for the chance to win product! you have such a great mix of papers/collections here! I love them all and could find a use for all of them, too! Great job! I am a little partial to Hey Pop right now just because I have only boys in my family... other than me of course! Thanks! They are all wonderful! But Summer Paradise is what I will get for sure! Just love the great colors -I wonder if this will work well with the SNAP system? Summer Paradise is my favorite. I love the summer set and the dad set - both have great colour schemes for scrapping my boys! Fresh air - but I love them all! They're all really good!! I love the subtle pastels of Fresh Air, and I also like the teal and orchid of Hey Mom, even though I really don't like purples. (The awesome mason jar images help a lot.) Nicely done!! Really like the Dad one. All are lovely, but I really like the colors/sayings on Hey, Mom. I Love Hey Pop and Summer Paradise!! Great color combos!!! Love the fresh air one,but love them all. Oh wow! I can't pick a favorite here! I love them all!!! Love all of them but Summer Paradise is at the top of my list! love this so much... can't wait to get my hands on it. Wow !!! I just love all of these !! My favorites are Hey Mom and Hey Pop. Seriously love all SS !! Thanks for a chance to win. oh gorgeous! love the summer stickers - they are perfect! the papers too ! They are all so awesome. I am totally loving the dad set! Love the Fresh Air Simple Set. It's gorgeous and would make some very awesome cards and page layouts. Love them all too but Hey Pop is my fav!! I love Hey Pop. Great colors and patterns and it will be fun to create with. Wow! Love them all, especially Summer Paradise! Ooh I love the hey mom collection most of all, but they're all really cute!! I love 'hey pop' because it's so hard to find such a great 'male' collection. Loving all the new stuff. I am wondering where to buy it all though? I was buying Simple Stories at Archiver's but they are closing next month! Live the idea of mini collections! that will be nice! After these past few days of sub-zero temps I think the Fresh Air Set is great! However, I still love all the other collections. DIY is the best. When can I get my hands on these. Summer paradise and hey pop will definitely be coming home to live with me! I am excited to try it! So glad my local store carries you! I love all these sets, what a great collection of new sets!! Hey Mom is my favourite so far, but it was hard to choose as I love Hey Pop too ! I love those colors so much! Awesome! These sets are adorable. I think I need them all!! Great collections. I can't wait to get them! These are truly amazing; such great colors. WOW ! These make it all so easy. I especially love the Hey Mom line ! I am loving all 4 new lines! I especially am loving the Hey Mom line. My favorite is Summer Paradise - the colors just pop! I just love the Hey Mom line, the colors are perfect! I could see myself making a Mom layout and a few Mother's Day cards too! Then I could scrap anything I wanted with the rest because it's so versatile! I love ALL of them but Hey Pop! completely stole my heart! Pinned and Pinned...and pinned! amyadams04 is my Pinterest name. Love! Love the Fresh Air set! Hey Pop is Perfect for my husband...I just love it! Loving the summer paradise collection! !